Calendarscope is a complete calendar-based personal organizer which can keep track of both personal and professional activities. The program provides you with a way to keep up-to-date with meetings, business appointments, birthdays, vacations, anniversaries and other important dates. It includes encryption and password protection to keep unauthorized persons from accessing your data. Each entry inside of the calendar can be customized by changing fonts and colors, adding sound files and alarms or linking entries to web addresses. 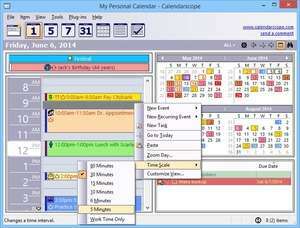 Calendarscope 10.0 is a shareware program and can be used as a demo to try the software until the free trial period has ended. A full version of the program is available after the trial period ends. For security reasons, you should also check out the Calendarscope download at LO4D.com which includes virus and malware tests. Additional screenshots of this application download may be available, too.